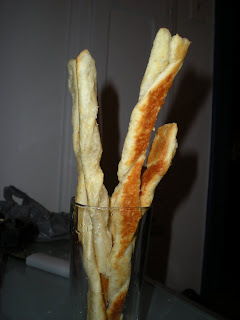 These flaky, twisted and crispy cheese straws are great for starters when you have guests coming over and also, great for decoration. They are quick and easy can be served with drinks at any occasion. They can be eaten as plain or strong flavors added. 2. Roll out puff pastry, not too thin, on lightly floured surface, trimming the edges. 3. In a small bowl, beat egg and water with a fork. Brush the whole surface of the dough with the egg mixture. 4. 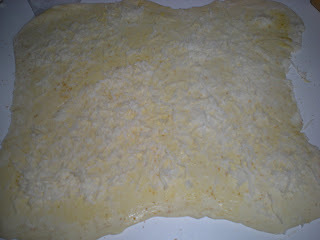 Fully cover the top of the dough with cheese. 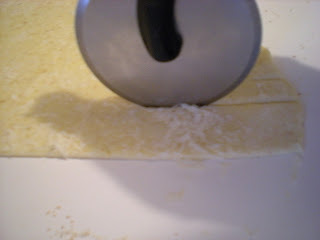 Using a rolling pin, lightly press the cheese onto the pastry. 5. 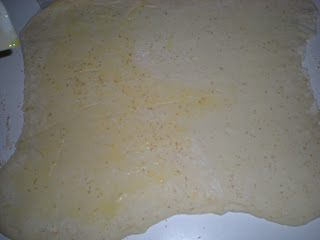 Using a pizza cutter, cut the pastry into strips about 1/2in (12 mm) wide. 6. 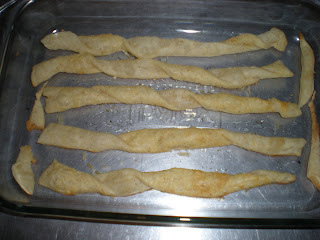 Holding both ends, twist strips into a spiral and place, well spaced, on lightly oil baking sheets. 7. Bake for 12 mins or until golden. Maximum 15 minutes, otherwise it darkens. Let it cool for a few mins. For decoration, put the sticks into a tall glass. I've been meaning to try this. It's in my book "Kitchen Bible!" Seems easy enough. I think I will give it a go! No effort needed. You only have to play with the puff pastry then, add some toppings and you're all set!